The practice of using gravel and rocks in the construction of ponds has been a subject of contention among enthusiasts. Much of the debate is a result of confusion regarding the role of gravel or rocks and the manner in which they should be used with water features. There are many myths which have arisen regarding them, and below are some of the most common, along with explanations as to why they’re invalid. Rocks or gravel are not harmful to your fish so long as you purchase the proper varieties. The best types are those that will not cause fluctuations in your pH levels or degradations within the water. Most dealers who sell gravel or rocks for ponds and aquariums have a vested interest in insuring they don’t kill the fish, as doing so would hurt their business. Put another way, it makes no sense for these dealers to sell you rocks or gravel with jagged or sharp edges, but if you’re gathering rocks from a nearby lake, river or ocean for your pond in order to save money, then perhaps they have sharp edges that could be the source of the problem. While this can happen, it is not the gravel and rocks that are ultimately at fault, but mistakes on the part of the owner. If you use random rocks in your pond which were not purchased from a specialty dealer, then there is a good chance damage could occur. Damage is also likely whenever rocks or gravel aren’t positioned correctly. Another way to avoid this scenario is purchasing a durable liner. Rocks or gravel which is purchased from a professional play no role in dirtying your pond; its cleanliness is dependent on how well you maintain it. It is certainly true that if you throw a random rock into your pond that has dirt and grime on it this will end up in the water. In fact, high quality gravel and rocks can actually contribute to its cleanliness by increasing filtration which results in cleaner water. While it is true that toxic gases can appear in ponds which wipe out the fish, there is no concrete evidence that this is being caused by gravel or rocks. 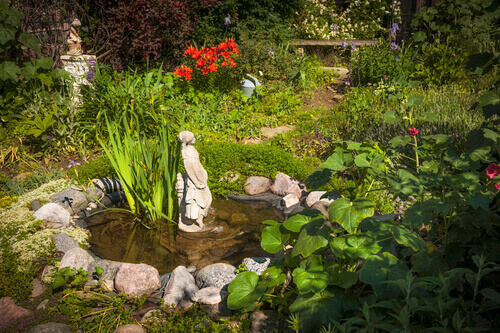 Toxic gases are typically the result of laziness on the part of the owner when it comes to pond maintenance. Ponds are complex systems, and as such they must be regularly maintained or become subject to the laws of entropy (increasing disorder). The toxic gases which you are seeing in your pond could be the result of leaves or other materials which have accumulated in the water over time. Gravel and rocks have been used in manmade ponds for years, and they are also found in natural lakes, ponds, streams and oceans. When properly selected and installed they provide more advantages than disadvantages.